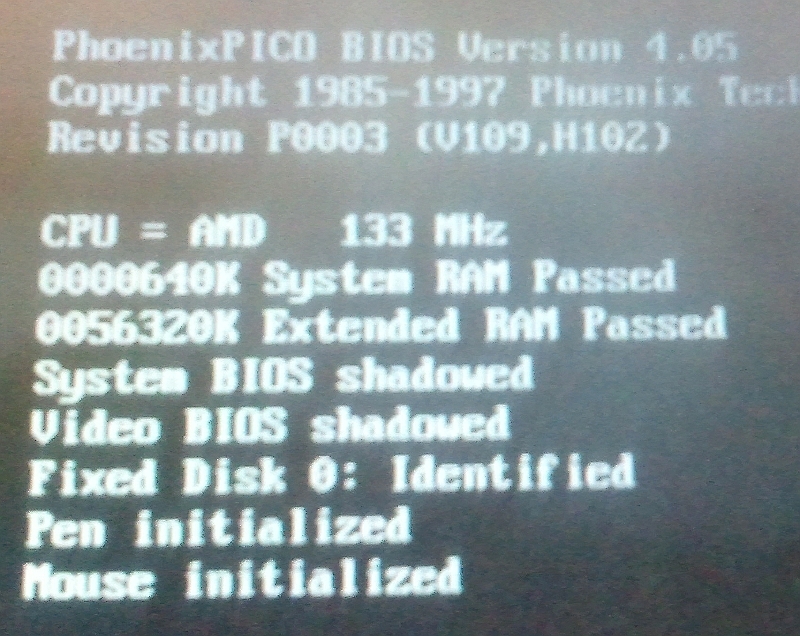 So i have this Fujitsu Point 510 ancient TabletPC that i play with once every 6 months. Its a pretty old device (i think from 1991 or so) but that doesnt make it any less intresting! It features a 10.4″ resistive touchscreen, some extra buttons (for rightclick, contrast, soundlevel), indicator lights for HDD, battery, operation, builtin mic and speaker, a place for the pen to reside, IR, DSUB-9 serial, PS2 for a keyboard, two (i think) proprietary connectors (printer/dockingstation maybe) and a PCMCIA Slot for 16bit cards. Yes, its one slot, but it can handle those cards that need two slots because of their size. 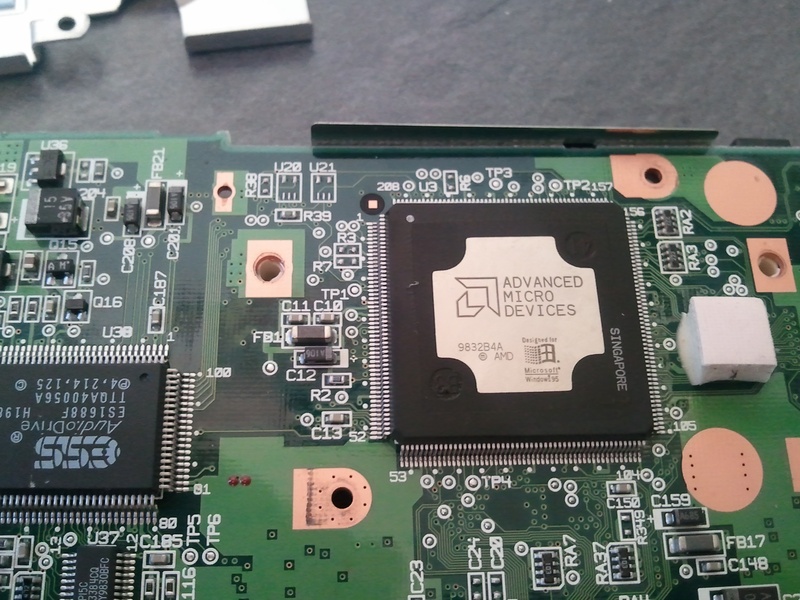 Internally it has a 100Mhz AMD CPU and 8MB of soldered RAM which can be expanded easily with two modules. More on those two later. Also, there is room for a 2.5″ IDE harddrive (i have read about some upper size limits somewhere) which is about 3GB big. On the CPU and again on the case itself, it states that this machine is designed for Windows 95. Actually, Windows 95 runs pretty smoothly on there (check out the Solitaire Animation on YouTube) and there are actually still drivers available from here (just select TabletPC->Point, all the drivers there should work since the hardware didnt really change between the versions). But then again, Windows 95 is just not quite ready for nowadays tasks, especially network/internet or multimedia. And who still supports Win95? So now there are two options: install Windows98SE or install Linux. For the Linux part (which i will do eventually hopefully [probably in 6 months, or later], please check the links at the end). For the Windows98SE part, go on reading. Since the Point 510 doesnt provide a Floppy or CD drive (one could try PXE or CD via PCMCIA), its probably the easiest to take out the harddrive, plug it onto a 2.5″ to 3.5″ adapter and put it into a regular PC. Taking out the harddrive is quite easy since its installed in a booth which can be taken out after loosening one screw on the side. Once you have the Win98 (se) CD in the drive (you either need a bootfloppy or a bootcdrom, i used a win98 boot cdrom which loads CD-Rom drivers from bootdisk.com) the installation is relativly straight forward. One thing i strongly advice is to boot up your system on the Host and copy the whole CD contents to the harddrive. Windows98 will ask you for the CD whenever you even think about changing a driver or adding a new software component. You should also install the touchscreen drivers (using the windows 95 ones works just fine), because otherwise you will be stuck with a system that you cant control. Afterwards, put the harddrive back and it should work allright. In order to get a little more bang out of your point, you can overclock the CPU to 133Mhz and install more RAM. First the easier part, which is installing more RAM. 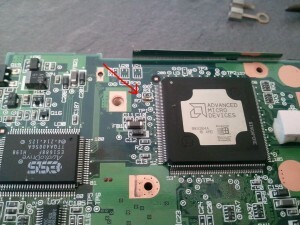 On the back of the Point 510 is a compartment which houses two slots for 72pin 3.3V EDO SODIMM Laptop RAM modules. Those a quite rare nowaydays but i found a store on Ebay that still sells them. They ship overseas, are totally nice and: it works! I ordered two 16MB modules and two 32MB modules just to try some combinations. Everything but the 32MB+32MB+8MB (builtin) combination worked. 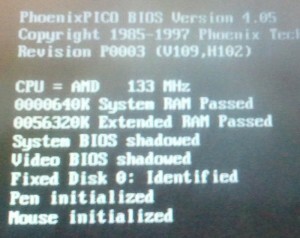 The 64MB would show up in the BIOS check, but the system wont continue to boot. So if one were to remove the internal 8MB, it might work. So my machine runs with 56MB (32MB+16MB+8MB). Another intresting detail in the above image is the frequency of the AMD CPU beeing 133Mhz instead of 100Mhz. This can be achieved by a hardware modification. Be warned, this should just show you how to do it, its not a garantuee that you wont break your device. All modifications are done at your own risk! 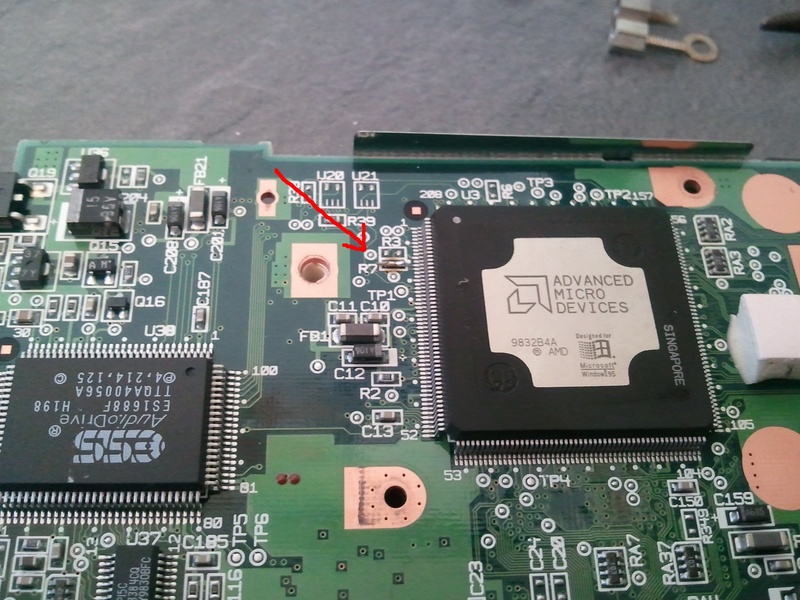 Before you reassemble the Point, try out if it still boots (hookup the screen and power). If it does: congratulations! Since Windows98SE didnt quite fullfill my needs, installing Linux (some stripped down gentoo maybe) will be one of my future projects. UPDATE: another modification i did was to take a cf-to-ide (2.5) adapter and plug it into the Point510, instead of the harddrive. Now its totally passive, should use less power and is of course much more quiet. works like a charm. maybe its even faster. The adapter can be also bought at ebay. You are currently browsing the Life is a Project blog archives for October, 2010.